Chess Rally Game - Download and Play Free Version! You can’t move a pawn without bumping into a computerized edition of chess these days. Thanks to many advances in AI programming, computer-controlled chess opponents have been getting progressively smarter over the years. However, no matter how smart a computer can get, it will still never be as intelligent or unpredictable as a human. Chess Rally combines the best of both worlds by letting you play a match of the king’s game against anyone who’s brave to challenge you on an online board. You don’t need to play basic chess if you don’t want to. Chess Rally hosts a number of options that allow you to alter the game we all know and love in any number of ways. Set a time limit for how long the game can last. Decide how much control each player has in promoting their pawns. Check off which house rules you would like to permit. Set new draw conditions, allow for en passant pawn captures, and more. Determine if a turn is ended via the press of the button or by just making a move. 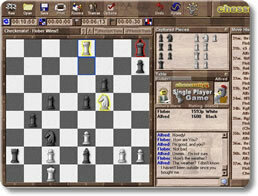 Although you can play against the computer if you want, the bread and butter of Chess Rally’s gameplay is in the myriad of ways you can go up against another human. Play a hotseat game against another player on the same machine. Play an email game where you and a buddy can each play at your own paces by using the built-in email feature. Play a direct network game where two humans can face each other in a local area network. Head on over to the Online Rally Rooms to join a server and challenge another player online. Set up your own server with your house rules in place. See who’s brave and clever enough to face you on your terms! Are you seriously getting your behind kicked in chess? Do you feel unsure if your skills are up to the test? Don’t get discouraged! Chess Rally doesn’t just provide an outlet for people to play chess; it helps them improve their skills along the way as well. Play against the computer for practice. Check the Move Suggestions option to receive some strategic suggestions at every turn. Use Experimenting Mode to change the board layout and practice different strategies for specific situations. Turn on the Risk Indicator to see how risky your next move could be and avoid common mistakes. Review all of the moves that have been made so far with the Move History feature. Rate each game you play to see how much you’ve improved over time. 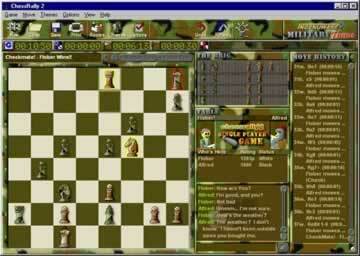 Chess Rally may have a lot of stiff competition in the computer chess world, but it stands head and shoulders over the rest in terms of its multiplayer functionality. You can customize your game, implement the house rules you want it to follow, and see just how well you can operate under them. It also offers a myriad of ways for you to improve your strategic skills, making it a great learning device as well. Chess Rally is a must-have game for anyone of any skill level who wants to play a good game of chess at any point in time.